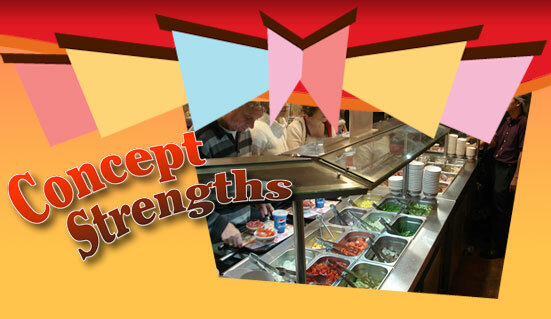 For your first dining experience at Attila Mongolian Grill your senses will become highly aroused at the bright contemporary décor, the artistic lighting, the clean crisp modern design, our massive 8 foot round grill, our stadium-like preparation area, and our inviting buffet style produce bar. Your mouth begins to water as you watch fresh beef, lamb, chicken, seafood and fresh vegetables being expertly prepared by our Master Grillers. Your own unique and individual creation sizzles on the grill, sending a rush of well seasoned steam skyward, filling the air with a heart stopping and mouth watering aroma that pleases all senses as you watch our Master Grillers put the finishing touches on your feast. In today’s Fast Casual dining segment, Fast, Fresh and Healthy, the cornerstones of “Fast Casual” fare, seem to be convenient advertising messages, rather than substantiated claims. To this end, Attila Mongolian Grill is truly unique. Fresh raw cut vegetables prepared daily, butcher quality lean meats, luscious seafood, no deep fry, no grease, no lard and no pre-cooked preparations. Every meal we serve is cooked to perfection right in front of the customer. The freshest available ingredients straight from the customer’s bowl, to the grill, and to the plate in just 5 minutes! Now that’s Fast, that’s Fresh, and that’s Healthy. 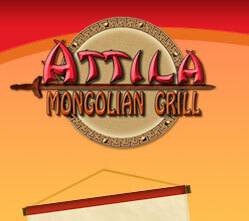 Franchising with the Attila Mongolian Grill is a great way to become part of the fast casual dining industry. Our franchisees benefit from a system that has already proved to deliver better value for every operating dollar—a system that has undergone five years of fine-tuning. Additionally, the Attila Mongolian Grill corporate staff continues to look for new ways to grow and to develop systems that ensure each franchisee is receiving the best support and most up-to-date information on where we’re headed as a company.